Water levels could rise in small rivers and creeks and debris flows could hit areas scarred by flames, including where a November wildfire killed 86 people and destroyed nearly 15,000 homes. A week of storms has left authorities concerned about the potential danger for thousands of people living in foothill and canyon areas devastated by last year’s wildfires. Wind-whipped flames roared across immense areas of the state, leaving hillsides bare of vegetation that stabilizes soil and prevents mudslides. People were told to be ready to flee from Pulga, a canyon community neighboring the town of Paradise, which was virtually incinerated two months ago by the Camp Fire. The storm is expected to arrive Wednesday afternoon and continue into Thursday. The National Weather Service warned of possible flooding later in the day in the county where the wildfire burned. The storm could be the strongest that Northern California has seen so far this year, with heavy rain in the San Francisco Bay Area that has led to a widespread flash flood watch in the afternoon. The Sacramento area faced flood and high wind watches, with gusts that could lead to power outages, downed trees and tough driving conditions. A blizzard warning for much of the Sierra Nevada and Lake Tahoe was to go into effect Wednesday night, with meteorologists predicting as much of 5 feet (1.5 meters) of snow in upper elevations and wind gusts of up to 100 mph (161 kph) on ridgetops. In the mountainous community of Truckee where it snowed Tuesday, residents were preparing for the storm by clearing driveways and buying wood and food in case they have to stay inside. Weather officials expected dangerous and potentially life-threatening conditions at elevations above 7,000 feet (2,133 meters), with high avalanche danger throughout the region. 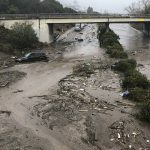 On the Central Coast, several thousand people heeded a mandatory evacuation order Tuesday in Santa Barbara County, where a sudden debris flow last year swept through Montecito, killing 23 people and destroying 100 homes. “It’s a complete drag, but it’s better than dying in a mud debris flow,” evacuee Daphne Moore told Los Angeles news station KNBC-TV. Officials have allowed people to go home, and though more rain is expected, it isn’t enough to be a serious threat. Some evacuation orders remain in the Malibu area west of Los Angeles and parts of neighboring Ventura County. Both were affected by a November fire that destroyed more than 1,500 homes and killed four people. Paul Manion was busy filling sandbags in the community of Bell Canyon. In Malibu, sheriff’s deputies with clipboards went door to door at the high-risk Paradise Cove mobile home park. Beaver Valenzuela said he’s survived fiercer storms and wouldn’t leave until he was convinced the danger was more immediate. Hurricane Joaquin Gains Force Near Bahamas, Heads Toward U.S.